I love to take macro photographs of raindrops, though this photo is from my archive. We had our first snow last night, so there will be no new sunny flowers till spring. Not just because there are no more flowers this year, but these macro photos don't look the same in winter lighting. 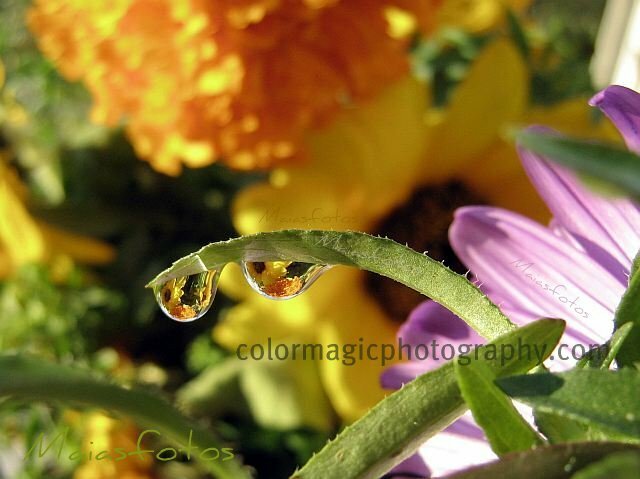 See some more of these macro photos at my raindrop gallery. C'est fascinant, les gouttes d'eau ! Avec ces couleurs, les reflets en sont d'autant plus intéressants ... J'aime bien ! Breathtaking capture! Such a perfect reflection in such a tiny, but ever so clear space! Stunning! Hope you have a wonderful weekend! I think I must be the only one left who still can't do this. And not for want of trying. Stunning... Those drops look so delicate... You did a very good job by taking this macro picture. This macro shot is stunning and the drops are like little windows. Beautiful reflections! Miniature flowers captured in those drops - exquisite. Delightful how the colours seem to melt in the raindrops! This is one of the truly remarkable images of the day. The composition is so good! My eye is drawn right into the water droplets. The focus and colors are perfect! Beautiful! I always wanted to learn how to do this dewdrop reflection. Does it need special setting in your camera? Oh, this is just gorgeous! I, too, love raindrop photos-- and living in the pacific northwest gives me plenty of opportunity to take them! I'm not sure I've ever taken one as lovely as this, though. Nice job! No Gardener, it doesn't need special setting or equipment. I described how I make these photos in a very simple tutorial at this post. What a beautiful photograph! This is so good!